​The ministries of Lutheran Church Charities are followed by local, national and international media, specifically in the areas of LCC K-9 Ministries, Disaster Response and Crisis Response. To read more about how LCC shares the mercy, compassion, presence and proclamation of Jesus Christ to the communities we serve, follow us In The News. ​While volunteers have offered aid to Tropical Storm Harvey evacuees in Bell County, there may not be any who have garnered more attention than the four-legged volunteers who stopped by to offer a paw Wednesday at the Wilson Recreation Center. Golden retrievers Abner, Pheobe and Pax are part of the K-9 Comfort Dog Ministry from Lutheran Church Charities. Janice Marut was one of many volunteers escorting the animals to Bell County Wednesday. “On a regular basis, we visit schools and nursing homes, but when there is a natural or manmade disaster, we can be deployed to go out and work in that,” Marut said. ​Help is on the way to Houston from Chicago, but with all the airports shut down, getting there will be a challenge. ​LCC K-9 Comfort Dog Luke was trained by Lutheran Church Charities and placed with Christ the Shepherd Lutheran Church in Alpharetta, Georgia during handler training on August 10, 2017. LCC K-9 Comfort Dog Luke works with multiple handlers who are also certified by LCC and receive ongoing and advanced training along with him. LCC K-9 Comfort Dog Luke is dual-vested, meaning he also has handlers who are veterans. They take him out as Kare 9 Military Ministry Dog Luke serving Veterans, Military and their families. They take him to veteran facilities and ceremonies as well as personal visits with veterans. 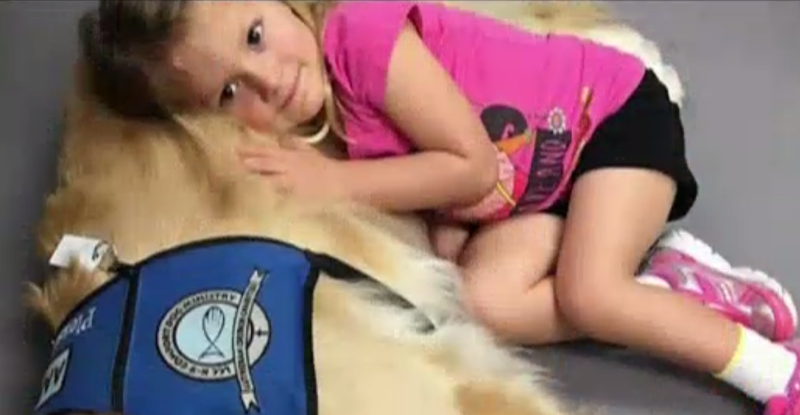 LCC K-9 Comfort Dogs serve every day in the community in which they are placed. They are also deployed in times of disaster and crisis to bring comfort to all those affected, including first responders and the volunteers who serve them – serving those who serve. LCC K-9 Comfort Dog Luke is just beginning his ministry with his handlers through Christ the Shepherd, Alpharetta, Georgia. They look forward to being an active presence in their community. 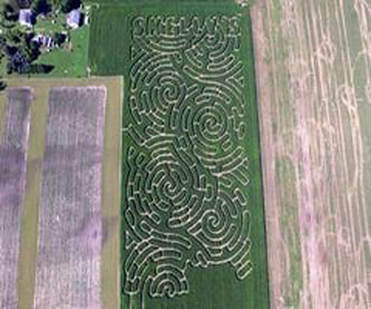 ​JANESVILLE -- Few guests ever get through the Impossible Corn Maze and find all the checkpoints without using a map at Skelly's Farm Market, 2713 S. Hayner Road. On Sunday, teams of one to five people can challenge themselves in a fundraiser for St. Paul's Lutheran Church in Janesville. For a $50 entry fee, team members can see how fast they make it through the maze and find the checkpoints without using maps. Each team will get a sealed envelope with a map, but if team members open the envelope, they will not win a prize. Money raised will support the church's comfort-dog ministry. 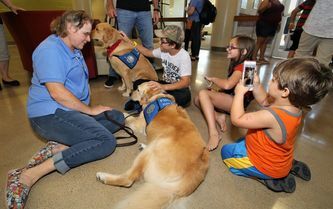 Comfort dogs of Lutheran Church Charities are highly trained golden retrievers used to respond to a variety of emotional needs. The dogs provide “a low-stress environment where people can pet the dog and feel relaxed,” according to a news release from St. Paul's Lutheran Church. The church's dog would be the first Lutheran Church Charities K-9 comfort dog in the southern Wisconsin area. The dog would serve all of Rock County and beyond, said Cheryl Skelly, a member of St. Paul's church, who is helping with the effort. At least four comfort dogs will be at the event. Church members hope to receive their dog in 2018. Money from the fundraiser will help cover the final costs of the dog's training, ongoing dog care expenses and travel expenses for the dog and handlers. The race is part of a larger Corn Fest fundraiser featuring grilled sweet corn, meat, games and more. 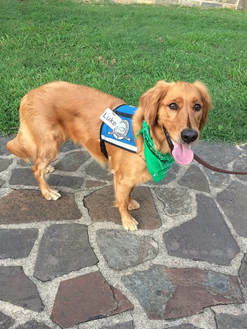 ​Cubby the Comfort Dog invites friendly petting with her blue vest stating her name and the words, "Please Pet Me." In the pocket of her vest are business cards, and each year, her handlers give out a thousand of them, promoting the work she does. 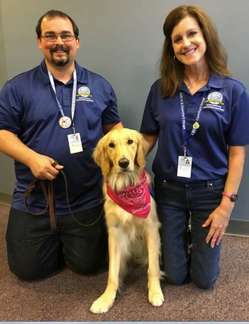 Cubby, a 3-year-old golden retriever, is a K-9 Comfort Dog that provides therapy and comfort nationwide through one of 15 care ministries of Redeemer Lutheran Church in Fort Collins. 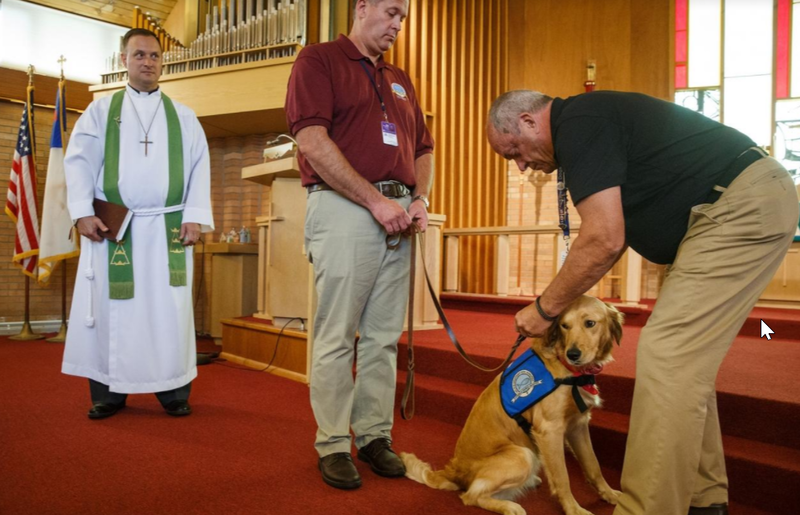 She's the only K-9 Comfort Dog in Colorado trained to be part of a program offered by Lutheran Church Charities, a nonprofit affiliated with the Lutheran Church Missouri Synod. "She provides the comfort of that soft touch," said Kathy Tripcony of Timnath, the Top Dog who oversees the program, sets up appointments and is one of Cubby's handlers. "She provides stability; she provides calm; she provides hugs." ST. LOUIS - Even on a dreary morning, Noah the comfort dog is a ray of sunshine. "He is a special dog," said Glenn Nielsen, one of his handlers through Timothy Lutheran Church in South City. ​The 4-year-old golden retriever is cheery and playful, and his day job is simple: making people happy. But this weekend, he has his work cut out for him. "We are headed to Clinton, Missouri. We'll be the public viewing and then funeral service for a police officer that was shot, Gary Michael." There they'll greet law enforcement and community members as they enter the memorial services. "We find that to be a very helpful thing for people who are grieving or hurting or suffering." Garbed in her blue Comfort Dog vest means that Damaris is on the job. The purebred Golden Retriever is quiet, attentive and listens to what her handlers at Memorial Lutheran Church, 5810 Third St., Katy, tell her to do. Though the Lutheran Church Charities K-9 Comfort Dog Ministry began in August 2008, it's only been operating in Katy since February. The Katy ministry is only one of four Comfort Dogs in Texas, with one in Austin and two in Fort Worth. So far this year, Damaris has made regular visits to the Katy Police and Fire departments, The Ballard House, which provides temporary housing for patients being treated for a serious medical condition and their families, schools and the YMCA, among other places. ​The loss of a loved one, confronting a serious illness or the pressure of a natural disaster such as hurricane Katrina, has a devastating psychological effect in human beings. But the LCC K9 Ministry program is here to reduce that stress and that suffering. Their more than 120 comfort dogs are always ready, at no cost, to visit schools, hospitals, disaster zones and other places. This little angels on four paws are trained to give help and unconditional love to whomever might need it. 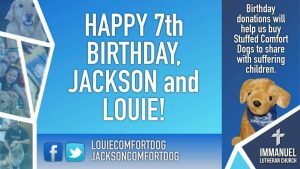 ​The Joplin Comfort Dogs turned 7 this week! Immanuel Lutheran Church held a birthday party for Louie and Jackson Sunday morning. You’ll remember Jackson and Louie were wounded last summer when their church van was opened fired upon on their way to St. Louis. They’ve since fully recovered. Party goers had cake, and got to see a presentation about the past year, and their hopes for the future in their ministry work. Louie and Jackson even received donations in their honor so customized toy dogs that look just like them could be purchased for future children that they meet that are sad and hurting. Disaster. It strikes when you least expect it. It leaves individuals and, often times, communities feeling uncertain, anxious and heartbroken. Although it takes time to work through the overwhelming emotions that come along with an unexpected event, Lutheran Church Charities’comfort dogs have seemed to meet a need in the grieving process recently.